Students learn the addition facts for every pair of single-digit numbers to 20. 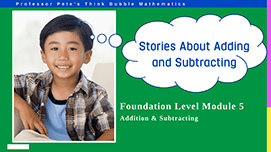 These resources are designed for students who are learning the facts to 20 for the first time. Introduction to the strategy of “Count on 1”, using ten frames and number line for subitizing answers. Includes turnaround facts and missing number questions. 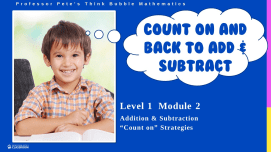 Introduction to the strategy of “Count on 2”, using ten frames and number line for subitizing answers. Includes turnaround facts and missing number questions. 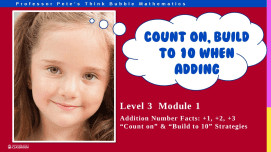 Introduction to the strategy of “Count on 3”, using ten frames and number line for subitizing answers. Includes turnaround facts and missing number questions. Introduction to the strategy of adding 0 and 10, using ten frames for subitizing answers. Includes turnaround facts and missing number questions. 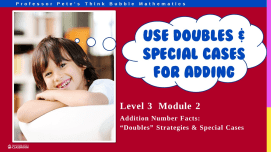 Introduction to the strategy of doubling numbers, using ten frames for subitizing answers. Includes turnaround facts and missing number questions. 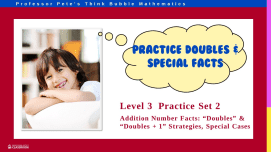 Introduction to the strategy of “Doubles +1”, using ten frames for subitizing answers. Includes turnaround facts and missing number questions. Introduction to the strategy of “+9, Near 10”, using ten frames for subitizing answers. Includes turnaround facts and missing number questions. Introduction to the strategy of “+8, Near 10”, using ten frames for subitizing answers. Includes turnaround facts and missing number questions. Revises all previsously learned addition facts to 20. 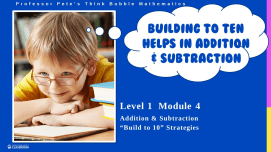 Set of 5 assessment tests to check on how students are progressing with each of the units in the Introductory Addition Number Facts series of worksheets. 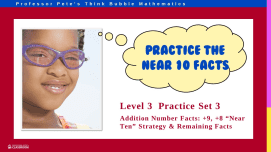 Set of 10 homework sheets to match each of the sets in the Introductory Addition Number Facts series. Contains information for parents.